If you can’t survive without your morning espresso, you have a $1,500 a year habit. If, like me, you often need a 2nd one, and your other half does too, that’s $6,000 off your household’s bottom line. It’s called the Rocket, and the coffee YOU can make with it is BETTER than you can get from most cafés, and so cheap its almost free! OK, but first you have to buy the machine, and it’s eye-wateringly expensive. Atomic has them for $3,444. And as soon as you get it home and try pulling a shot using supermarket-bought, pre-ground beans, you’ll appreciate that what you really need is a proper burr grinder (which will set you back another $1,084) and some really fresh whole beans (the ones I buy from Atomic at $10 a bag are still warm when I get them home). A double-shot long black uses about 70 cents worth of beans. 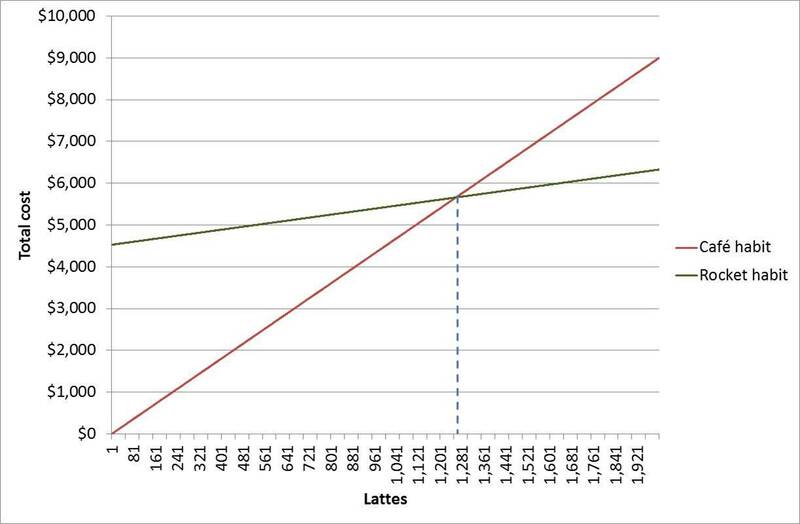 If you’re a flat white or latte drinker, add 20 cents to that for milk. 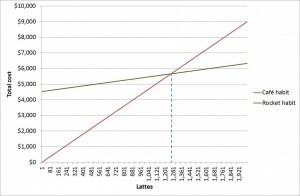 So every latte you make is actually SAVING you $3.60! (compared to the usual $4.50 for a bought one at Auckland or Wellington cafés). So after 1,258 coffees, your Rocket and burr grinder will have paid for themselves. If you live in a 4-coffees-a day household, that’s just 10 months to get your initial investment back. After 5 years, you’ll have saved $21,314! If you invested $4,528 in the sharemarket, you would have to make over 36% per year to turn it into $21,314 in 5 years. So this could well be the best return on investment you ever make. Even if you ‘put it on the house’ at 6%, you’ll still be making a whopping 30%. Disclosure statement: I have no pecuniary interest whatsoever in Atomic Coffee – but I think they’re a great bunch of people and I love their coffee. 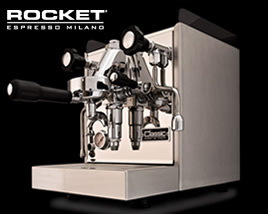 If you buy a Rocket from them please mention my blog – perhaps they’ll send me some free beans! One of the common criticisms of this analysis has been “yes, but that assumes you make all your coffees at home and stop buying them when you go out”. True. And I do confess to buying the ‘occasional’ caffeine hit when I’m out and about. But I am pleased to report that overall, our coffee consumption habits have changed since the Rocket came to live with us. Having good quality coffee at home really does provide a return on investment. After all, there are only so many coffees you can drink in a day. Making them is so much fun I’ve usually had my 2nd or 3rd before I leave the house. And (even if I do say so myself) it’s a rare and special cafe that can match one of my home made long blacks.